PPC marketing is an essential part of an apartment marketing strategy if you want to attract qualified renters and sign more leases each month. However, it can take a lot of time and energy to create PPC ads for your multi-family complex that compel your audience to click and take action. To help you launch amazing PPC ads for your apartment, StrategyBeam has created a simple to use PPC generator tool that you can use today! While this PPC generator should not be used as the only element in your apartment PPC campaigns, but you can use the generated PPC ads to help you get started with your online marketing. StrategyBeam has over 15 years of combined experience working with business owners and apartment marketing managers just like you. We used our years and experience to create a PPC ad generator tool that will help your apartment community drive qualified traffic to your website! Marketing for an apartment community has become more complicated today than ever before. Not only are there more platforms to pay attention to market your apartment, current renters are also pickier with their purchasing decisions because they have an overload of information to compare the market. If you want to ensure you continue to sign more leases then you will need to focus on the online marketing channels for your apartment community that will help you reach your goals. Since potential renters have access to so much information online, you will need to master a number of marketing channels for your apartment. From SEO marketing for your community and even PPC multi-family marketing, you need to know how to leverage all available resources to help you achieve your monthly goals. If you are like many apartment marketers then you likely find it difficult to find the best approach to help sign leases for your apartment community. Instead of focusing on marketing strategies for your multi-family complex, you could focus on delivering great customer service and addressing the needs of your tenants. This is why it would be of great help if there was an apartment PPC generator capable of spitting out ad creative when you need it. Well, the good news is that our team of passionate apartment marketers developed an easy to use PPC generator specifically for apartment marketing managers who want to hit their monthly goals. 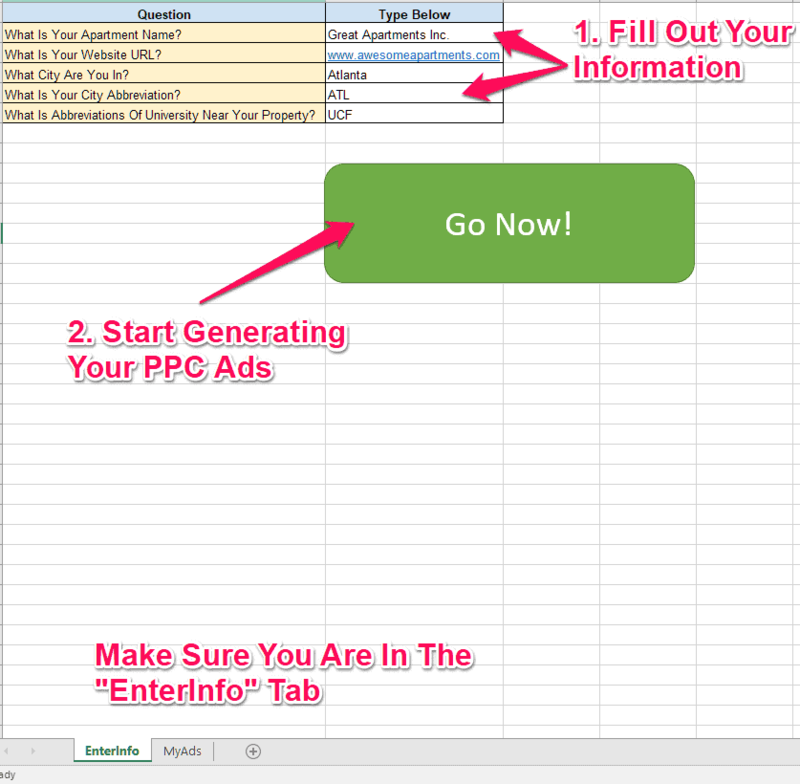 This free PPC generator will help you create high-performing text ads for Google AdWords and Bing Ads! We know that having an easy to use PPC generator tool is just as important as creating amazing ads for your apartment complex and this is why we created this PPC generator as a straightforward and easy to use solution. It doesn’t matter if you’re a beginner or an expert, rest assured that we can help you get the best ideas that you can utilize on your next PPC campaign. Once you’re done, click on the “GoNow” button for your information to begin processing, and then you will be instantly forwarded to the “MyAds” tab that will have all the ad information you need to build out your PPC ad groups. If done correctly, you’ll be directed to “MyAds” tab where the PPC generator will display relevant ads based on your apartment complex that you supplied in the previous step. From here, you’ll see all the information you need to generate profitable PPC ads for your apartment complex. The “MyAds” tab is designed to provide all the information you need to create effective PPC ads for your apartment complex. Take a look over the results, and simply copy/paste the resulting ad copy into Google AdWords or Bing Ads! Now you can launch PPC ads for your multi-family community without having to waste time or resources. Even with a helpful tool like our apartment PPC ad generator, there is a lot of other elements that go into making an effective PPC campaign. If you want to focus on growing your business and providing great customer service to your tenants instead of worrying about marketing you should consider hiring a professional marketer for your apartment complex. We are a talented team here to help you increase signed leases and grow your apartment’s online presence.